Another highly revered Nan temple, Wat Phrathat Chae Haeng is located on a low hill around three kilometres to the east of the town centre. This is one of the oldest wats in the area and indeed the original town of Nan was situated around this hill overlooking the Nan River, though apart from the temple no remains can be seen today. Information signs – which we have learned to take with a pinch of salt – have it being constructed in 1353 with the impressive 55 metre gold clad main chedi built to house a Buddha hair donated by famous King Lithai, ruler at the time of the nearby Sukhothaikingdom. The temple is reached by a wide naga staircase atop which is a car-park (if you’ve arrived by bike), with main temple to your right, a reclining Buddha image to your left and the chedi, in a colonnaded courtyard, straight ahead. It’s a scenic and interesting wat to wander around with views of the surrounding countryside -- it can get very busy with Thai visitors. Chae Haeng is said to have particular significance for those born in the year of the rabbit while the temple’s main annual festival takes place during the full moon of the fourth lunar month -- late February, early March—should you be around. 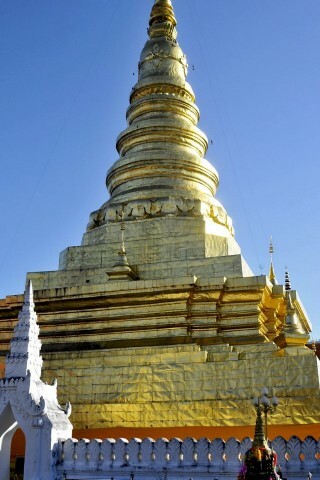 The wat is 3 km southeast of Nan on the road to Mae Charim. It is well signposted and best reached by bicycle or motorcycle. Any songthaew heading for Mae Charim district can drop you off at the foot of the stairs.